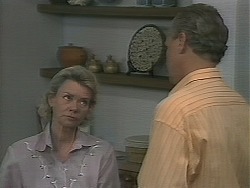 Beverly tells Jim not to gang up on her with Paul over the food poisoning at the Brasserie. 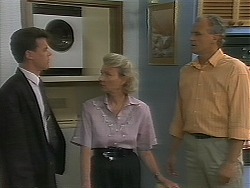 Paul goes to the hospital and advises Dorothy not to sue him. Ryan takes issue to Paul threatening his aunt and pins him up against the wall. Kerry and Lochie arrive at that moment and stop Ryan from thumping Paul. Paul says if Dorothy sues him he'll have Ryan on an assault charge. Lochie says that Ryan didn't even hit Paul! Helen and Jim are chatting about Bronwyn and Henry's forthcoming wedding in New Zealand. Helen isn't sure if she's coming back home yet - she's not convinced that Jim and Beverly have sorted out their differences. Jim assures her that everything will be fine. JIM: What about it? Will you come home? Lochie, Ryan and Kerry are visiting Dorothy. Kerry warns Dorothy not to take Paul too lightly - he can be quite nasty when he wants to be, such as when he threatened Kerry with a libel case. Dorothy says she doesn't know what she'll do yet - but Paul will probably have had a few strong words with his chef by now. DOROTHY: I'll deal with him in my own way. Joe is putting together a radio and Sky is watching. 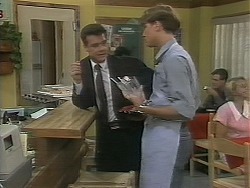 He reminisces about Toby - he used to think they'd go into business as Mangel & son. JOE: Not now. Well, now for a while, anyway. Doesn't matter though. (to Sky) Nothing wrong with "Mangel & daughter". That suits me just fine! Kerry hears this last exchange from the doorway and smiles. Chistina is moaning that Paul and Caroline are always talking about work. She feels out of it in her own house. She wants Caroline to say something to Paul about it. Dorothy is on the phone to her financial advisor. Ryan comes in with some tea for Dorothy that she's requested. She asks how he's enjoying Erinsborough High - Dorothy met the headmaster the other day. Dorothy advises Ryan not to get into any more fights - Year 12 is too important. 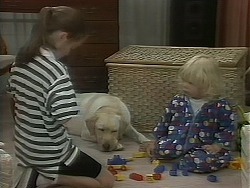 Joe is playing with Sky and Bouncer. Kerry is off to collect Lochie from school and to visit Dorothy. Kerry has forgiven Dorothy for the trouble she's caused. KERRY: I'm doing it for Lochie. She loves her aunt. JOE: Yeah, well, give her some arsenic from me! Dorothy is on the phone advising a friend of hers to cancel a booking with Lassiter's. Paul comes in - he's come to make a deal with Dorothy. If she doesn't take any action against Lassiter's he won't bring an assault charge against Ryan. To Paul's surprise, Dorothy agrees and offers him a cup of tea. She tells him she'll book into another hotel when she gets out of hospital. Also, she wants Paul to apologise to Ryan for provoking him. Paul reluctantly agrees. Paul comes in and Ryan is serving. He apologises for provoking Ryan in the hospital. Lochie is practising her handstands in the garden. Sky and Bouncer are playing happily. Kerry calls Joe to the kitchen to do something. Lochie comes in and builds a little man out of Sky's bricks then goes back outside. Caroline hasn't had a chance to speak to Paul about bringing work home yet. Just then Paul comes in and tells the girls that he doesn't want to discuss work at home anymore(!) Caroline says she's had a call from the Health Department - they're coming round tomorrow afternoon. Paul is angry - he knows he's got Beverly to thank for that. Joe thinks Sky had a big future as a civil engineer(!) When he's out calling Kerry, Lochie mischievously adds a bit on to the brick-man. Kerry thinks Sky is too little to put bricks together like that, but Joe is convinced they have a genius on their hands(!) Lochie giggles behind her comic. 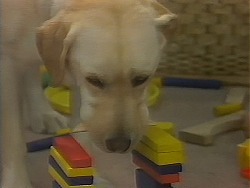 Paul comes in in a strop, looking for Beverly. She's not there, so he tells Jim and Helen to tell Beverly that she's fired. Helen says that Beverly was only doing her duty - salmonella cases have to be reported. Paul won't hear this though - he reckons Beverly is trying to get back at him because she had to go to the Medical Board over Gail. Helen is surprised that Jim didn't give Beverly more support in front of Paul. She doesn't think that Jim has come to terms with Beverly's career after all. Jim insists that he has, but Helen isn't convinced.